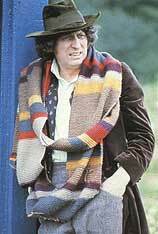 Both pictures show Dr Who’s Tom Baker wearing a large size scarf. The picture on the left shows the first colourway and the picture on the right shows the second colourway. Both colourways represented in these instructions are authentic to the show. 8 ply (DK to the non-Aussies) wool in the following colours and amounts. 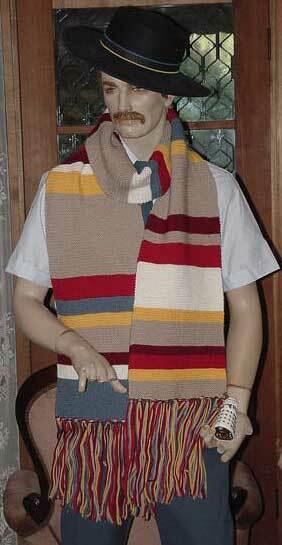 Approx 22sts and 44 rows to 10cm over garter st, though the scarf will stretch greatly when worn due to it’s weight. Using steel blue cast on 55 (80)sts. Work in garter stitch stripes in the following colour sequence. Instructions in brackets are for the larger size. For the brown-maroon scarf substitute maroon for white, dark brown for red, rust for plum, gold for yellow and mid-brown for steel blue. Neatly sew in all loose ends. Cut 60cm lengths of yarn in the following colours: fawn, red, yellow, plum, blue. Make fringe on cast on and cast off ends with one strand of each colour in each tassel. Trim neatly, measuring as you go to keep the fringe even. Text Copyright © Sarah Bradberry 1993. All rights reserved. Photo #3 copyright Sarah Bradberry April 2006. All rights reserved.